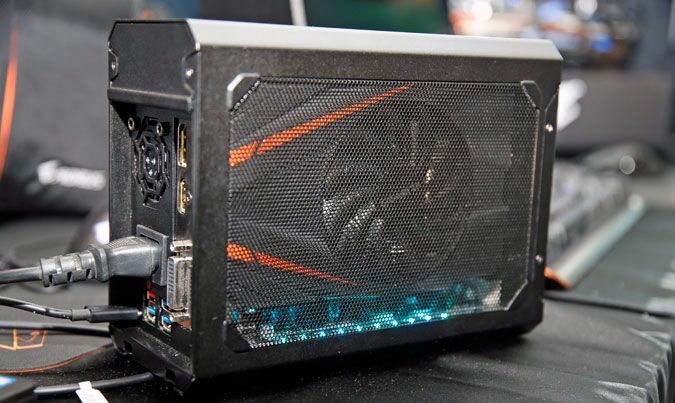 Gigabyte (via subsidiary Aorus) has released a Thunderbolt 3 external graphics dock that is specifically designed around miniaturized desktop GPUs. Additionally, the US$599 dock beats the competition by coming with a GTX 1070 pre-installed. Acer's portable Thunderbolt 3 (TB3) dock with a GTX 960m in it might still be the smallest graphics dock around, but Gigabyte subsidiary Aorus's GTX 1070 Gaming Box is most certainly the smallest external GPU (eGPU) we've seen that supports desktop GPUs. In addition to being built around housing a diminutive mini-GTX 1070, the Gaming Box trumps the competition by including that GTX 1070 with the device at a competitive price point: US$599. Once you take out the cost of a mini GTX 1070 (US$350-400), the Gaming Box is cheaper than almost all other TB3 eGPU competitors. In addition to the ports provided by the installed GPU (2 DVI, 1 DP, and 1 HDMI by default), the Gaming Box also provides 4 USB 3.0 ports. Due to its highly compact size, however, it can only be upgraded with miniaturized versions of GPUs, which you will have to hope will be available in the future. An additional (apparent) compromise is the lack of TB3 power delivery; it does not appear to support the feature. Though dimensions and weight specifications are not available yet, the advantage of the Gaming Box over other solutions are its (relative) value and highly portable form-factor. In fact, Aorus's solution comes with its own lunchbox-style padded carrying case so you can take it with you. Finally, while the GTX 1070 is a formidable card, its important to remember the performance drop seen when using TB3 for external graphics. In our review of the Razer Core, we found that a TB3-based eGPU with a 1080Ti often failed to outperform a notebook with its own mobile GTX 1060. Thus, an eGPU solution should only be considered if you plan to pair it with a laptop with integrated or entry-level dedicated graphics.